Play parcheesi and ludo multiplayer classic board game online! Playand compete with our community, invite your friends and family tojoin you and beat the highest scores of this awesome free Ludo dicegame! The game that defined your childhood now for free! Parcheesior Ludo classic is an adaptation of Pachisi, a classic board gameoriginated in India around the 6th century. The concept of thisfunny Parcheesi board game is clear: There are four players withfour tokens of the same colour with a goal... Play and beat theopponents by moving all of your Ludo classic tokens to your goalbox before everyone else and take the honor to be the king in thisfree multiplayer game! The parcheesi board has 68 boxes: Start inyour corresponding nest and move forward by rolling your dices withthe help of a dice cup until you arrive with your token to the goalbox. Think of a strategy to beat the opponents. Do not get upset!These free parcheesi star board games are easy to play but hard tomaster! Learn your own player tactics and achieve the necessaryskills to be at the top of our parcheesi USA game ranking! Enjoyyour childhood favourite board game now online and multiplayer!Chat with other players while you challenge them or one of theother thousands of players who make up our Ludo community! Becomethe king in this best free Parcheesi USA online game! FEATURES OFPARCHEESI LUDO MULTIPLAYER - CLASSIC BOARD GAME - Have fun playingthis free parcheesi multiplayer game! Upgrade your tokens withamazing emoticons and emojis! - Multiplayer board games: Chat,compete and invite and play with your family and friends! - Easyrules and intuitive gameplay: Challenge your family members inthese Parcheesi five-star family games! - Play special games:Choose between making a Ludo party team with a partner or playingturbo mode or private - Compete to become the best player in ourParcheesi board game ranking: Every match counts! - Get doublecoins when you win your games with the "Double or Nothing" in thismultiplayer game! The modern variation of Pachisi! - Unlock Ludoclassic board game achievements, progress getting gifts and coinsand climb the leaderboard until you become the king! - This freemultiplayer parcheesi by Playspace is appropriate to play in teamswith your family or friends! Recall your childhood star memories inthis free Ludo game, a variation of the ancient Pachisi game, alsoalso known as sorry game or trouble game! Enjoy the best board gamefor kids with this Parcheesi online in Playspace! Be the king ofthe dice and start playing a free Ludo match now! Have fun withyour family in this star popular Ludo online! Domino Online is an online multiplayer game where you can chat withyour friends while you challenge them or one of the other thousandsof players who make up our community. Be the best Domino onlineplayer! FEATURES Domino Online- It’s free to play!- Chat and playwith your friends.- Become the best Dominoes player in ourranking.- Play special games: in pairs, turbo and private.- Getdouble coins when you win your games with the "Double or Nothing"-Unlock achievements and progress through the game getting gifts andcoins.Remember, you will need to be connect to play. Enjoy the bestfree Dominoes online in Playspace!Thank you, The Playspace Team. Toma 2 Online is an online multiplayer game where you can chat withyour friends while you challenge them or one of the other thousandsof players who make up our community. Reverse! Take 2! Last! Be thefirst person with no cards left and beat all your friends!Be thebest Toma 2 online player!FEATURES Toma 2 Online- It’s free toplay!- Chat and play with your friends.- Play special games: inpairs, turbo and private.- Compete to be the best player in ourToma 2 Ranking.- Get double coins when you win your games with the"Double or Nothing"- Unlock achievements and progress through thegame getting gifts and coinsRemember, you will need to be connectto play. Enjoy the best free Toma 2 online in Playspace!Thank you,The Playspace Team. Crazy Wheel by Playspace is a multiplayer game with which you cancompete with your friends and see who is the most knowledgeable.Use the power-ups, check out the store and beat everybody.Shareyour achievements and scores to see who is the best player amongyour friendsBe the best Crazy Wheel online player!FEATURES CrazyWheel by Playspace- It’s free to play!- Chat and play with yourfriends.- Become the best Crazy Wheel player in the Playspaceranking.- Play special games: in pairs, turbo and private- Competeto be the best player in our Crazy Wheel Ranking.- Get double coinswhen you win your games with the "Double or Nothing"- Unlockachievements and progress through the game getting gifts andcoins-The games are intended for an adult audience.-The games donot offer "real money gambling" or an opportunity to win real moneyor prizes.-Practice or success at social casino gaming does notimply future success at "real money gambling".Remember, you willneed to be connect to play. Enjoy the best free Crazy Wheel onlinein Playspace!Visit our blog http://blog.playspace.com/ Thank you,The Playspace Team. Truco by Playspace is a card game with the spanish deck originallyfrom Spain. The Truco game is famous in all America, principally inSouth America. Truco has different versions, but the most famous isTruco Argentino.The goal is to get a number, sometimes the game isdivided on rounds.Playspace was born in 2011 with the aim totransfer the classic games to the online world. 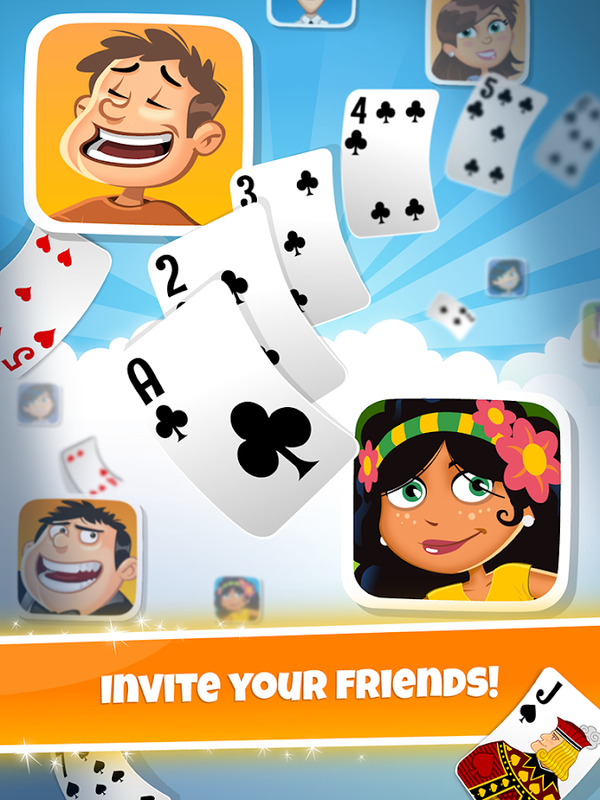 So the best Trucoonline has been created… Truco Playspace!Truco by Playspace is aFREE multiplayer card game to enjoy while you are chatting withyour friends. The best card online experience is here with Truco byPlayspace!FEATURES Truco by Playspace- It is free to play!- Chatand play with your friends.- Play special games: in pairs, turboand private- Compete to be the best player in our Truco Ranking.-Get double coins when you win your games with the "Double orNothing"- Unlock achievements and progress through the game gettinggifts and coinsDownload the app and enjoy with Truco by Playspace,the best Truco Game! Remember, you will need to be connect to play.Enjoy the best free Truco online in Playspace!Visit our bloghttp://blog.playspace.com/ Thank you, The Playspace Team.